Designed primarily for use in school playgrounds and children's play areas, Compliant wet pour is a safe impact absorbing surface that is both durable and low maintenance. 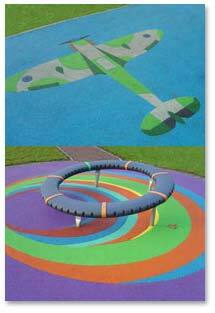 Compliant wet pour is available in a wide variety of eye-catching colours with a number of inlaid designs to help make play areas more attractive. Safe, strong, durable and low maintenance, Compliant wet pour can be laid onto any size greater than 50sq metres and any shape of area, including around existing play equipment. We offer a series of thicknesses to suit the critical fall height requirements of playground equipment, as specified in the European Standard BS EN 1177. Compliant wet pour surfacing has been fully independently tested by Sports Labs Ltd to the requirements of BS EN 1177 and BS 7188, including for the resistance to abrasive wear, dry and wet slip resistance, resistance to indentation and ease of ignition. A standard Compliant wet pour system consists of a variable depth bulk layer of black reclaimed SBR rubber, topped with a 15mm nominal thickness of bound EPDM rubber crumb. For most new developments, the surface is laid onto a recessed stone base. For best value, this base preparation can be carried out by the client. Compliant wet pour can also be laid onto existing hard surfaces if required. To speak to one of our wet pour specialists, please call us on 01858 545789, or email sales@sportsequip.co.uk. Compliant wet pour is fully tested to BS EN 1177 with fall heights of up to 3.2 metres. Copies of the full test results including extra tests for elongation and tensile strength are available upon request. How much does Compliant wet pour cost? Guide prices are available for the supply and lay of wet pour surfacing onto an existing suitable base. For bases that require additional work, please contact us on 01858 545789 for a quote. To discuss your project, arrange a free non-obligation quote or to simply find out more information about Compliant wet pour, call us on 01858 545789. Our website also contains a host of useful information, including wet pour datasheets, guide prices, test certificates, installation and maintenance information.